Gangsta title from THQ sticks it to runner-ups EyeToy: Play 3 and New Super Mario Bros.; Top 10 list bolstered by five DS titles. SYDNEY--Aussie gamers demonstrated once again that they can't get enough of the life-o'-crime title Saints Row--the title solidified its hold on the top-selling charts by killing the competition for a second week in a row. Sales figures from data trackers GfK Australia for the week ending September 10, 2006, show that the 360-exclusive Saints Row edged out Sony's latest EyeToy bundle, with EyeToy 3 landing at the number two slot its first week on the charts. The sales heavyweight of recent weeks--AFL Premiership 2006--slipped back to number four on the charts. Nintendo's portable powerhouse, the DS, had a strong showing (again), with five of the top 10 games in Australia going to the handheld. Now is your chance to fulfill Dr. John Hammondâ€™s dream by successfully designing and managing the ultimate dinosaur theme park. 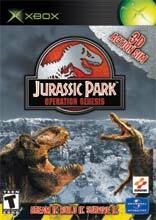 Jurassic Park: Operation Genesis allows gamers to create the most amaz..